Greenleaf was already on top of the world when this photo was taken in 1928. Although space doesn't allow for a complete description of all of Taberski's victories between 1916 and 1918, I can touch upon a few of the most important here. The first was his challenge match with Johnny Layton, which was held over three days in Layton's hometown of Sedalia, Missouri. Layton was Sedalia's first-ever national champion (in pool or any other sport) and the crowd was clearly behind him. He shot quickly, and with confidence, sometimes using his right hand, sometimes his left. Taberski, by contrast, annoyed spectators with his exasperating slowness and the first night did not go well for him. It seemed that the faster Layton shot, the slower Taberski became. To the untutored, it seemed a sign of uncertainty, of timidity, especially given the drubbing he received. Final score after the first night: Layton 150, Taberski 109. The next night went even worse for Taberski. He thought and thought and thought, shooting with all the urgency of a glacier. And while Taberski was doing all that thinking, Layton was pocketing balls. The hometown favorite outscored Taberski 150-74 on the second night, bringing the tally to 300-183. Tabeski had only one night to make up an 117-ball deficit. 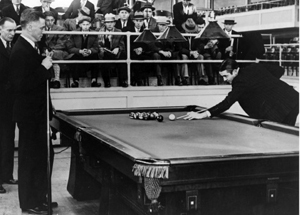 "In winning the world's championship from Layton, Frank made the greatest uphill battle ever known in a match of such importance," wrote Edward W. Cochrane for Billiards Magazine. No one before had ever pulled off such a come-from-behind upset: not Alfredo DeOro, not Bennie Allen, not even old Keough himself. "Taberski was 117 balls behind Layton when their last block opened in Sedalia, Mo., and it didn't look as if the Schnectady boy had a look in - but he came from behind and played a wonderful game." Greenleaf was too young and too green, too self-assured and probably too dumb to know he should be scared of Taberski. The Boy Wonder was in the crowd in Sedalia, witnessing the slaughter firsthand. But nothing in the record indicated it affected him in the least. Greenleaf challenged Taberski immediately and the two met the following month in New York City. The press accounts suggest he was furious in his assault. I love this description of Greenleaf from Billiards Magazine: "He shot with all the confidence of youth. He showed superiority as a shot maker. His position play was a little short of marvelous. His execution was deadly. Time and again the champion elected to play him safe but there appeared to be no safety with Greenleaf at the table." Greenleaf outscored Taberski 150-88 on the first night, and did so with ease. Greenleaf prevailed on the second night as well. The crowd was behind Greenleaf. Hell, the press was behind him. But Taberski remained steady, playing, as always, with the stoicism of a burning monk. And on the final night, the Boy Wonder fell apart. This was the account from Billiards Magazine: "The answer to the striking form reversal shown by the two players after the first night can be directly attributed to the fact that it was a case of a player with true championship temperament playing against a youthful and more or less unsophisticated challenger. If ever there was a champion with ideal temperament, it is Taberski. Nothing ruffles him. He never shows any outward sign of being in the least perturbed. He is calm at all times." The final score: Frank Taberski 450, Ralph Greenleaf 407.